A Mamluk (Arabic: مملوك (singular), مماليك (plural), "owned"; also transliterated mameluk, mameluke, or mamluke) was a slave-soldier who converted to Islam and served the Muslim caliphs and the Ottoman Empire during the Middle Ages. Over time they became a powerful military caste, and on more than one occasion they seized power for themselves, as they did in Egypt from 1250 to 1517. During this period, they maintained the Abbasid caliphate as the symbol of Islamic unity, thus ensuring continuity of the nominal leadership of the Islamic world. The first Mamluks served the Abbasids caliphs in ninth-century Baghdad. The Abbasids recruited them mainly from Turkic non-Muslims captured in areas north of the Black Sea, the steppes of present-day Southwestern Russia and the Caucasus. The mamluks were often sold into slavery by impoverished steppe families or kidnapped by slave-traders. The Mamluk system gave rulers troops with no link to the established power structure. The local soldiers were often more loyal to their tribal sheiks, their families or to nobles other than the sultan or caliph. Strong local networks such as these mean that if a Mamluk commander conspired against the ruler, it was often impossible to deal with him without causing unrest among the nobility. After Mamluks were converted to Islam, they were trained as cavalry soldiers. Mamluks were to follow the dictates of furusiyya, a code of conduct (similar to knights' codes) that included values such as courage and generosity but also doctrine of cavalry tactics, horsemanship, archery and treatment of wounds. Mamluks lived within their garrisons and mainly spent their time with each other. Their entertainments included archery competitions and presentations of combat skills. Intensive and rigorous training of each new recruit helped ensure a great deal of continuity in Mamluk practices. While technically they were no longer slaves after converting to Islam and undergoing training, they were still obliged to serve the sultan. The sultan kept them as a separate force, under his direct command to use in the event of local tribal frictions. Alternatively, the sultan could also send them as far as the Muslim regions of Spain. Sultans had the largest number of Mamluks, but lesser leaders such as amirs could have their own troops as well. Many Mamluks rose to high positions throughout the empire, including army command. At first their status remained non-hereditary and sons were strictly prevented from following in their fathers' footsteps. Over time, in places like Egypt, Mamluk forces became linked to existing power structures and gained significant amounts of influence over those powers. In 1206, the Mamluk commander of the Muslim forces in India, Qutb-ud-din Aybak, proclaimed himself sultan, becoming, in effect, the first independent Sultan-e-Hind. This dynasty lasted until 1290. The origins of the Mamluk Sultanate of Egypt lies in the Ayyubid Dynasty that Saladin (Salah al-Din) founded in 1174. With his uncle, Shirkuh, he conquered Egypt for the Zengid King Nur ad-Din of Damascus in 1169. By 1189, after the capture of Jerusalem, Saladin had solidified his Kurdish family's control over the Middle East. After Saladin's death, his sons fell to squabbling over the division of the empire, and each attempted to surround themselves with larger expanded Mamluk retinues. By 1200 Saladin's brother, Al-Adil, succeeded in securing control over the whole empire by defeating and killing or imprisoning his brothers and nephews in turn. With each victory, Al-Adil incorporated the defeated Mamluk retinue into his own. This process was repeated at Al-Adil's death in 1218, and at his son Al-Kamil's death in 1238. The Ayyubids became increasingly surrounded by the power of the Mamluks and soon involved them in the internal court politics of the kingdom itself. In June 1249, the Seventh Crusade under Louis IX of France landed in Egypt and took Damietta. At first, the Egyptian troops retreated. When the Egyptian sultan As-Salih Ayyub died, power passed briefly to his son Turanshah and then to his favorite wife, Shajar Al-Durr (or Shajarat-ul-Dur). She took control with Mamluk support and launched a counterattack. Troops of the Bahriya commander Baibars defeated Louis's troops and the king delayed his retreat for too long. The Mamluks captured him in March 1250 and received a ransom of 400,000 livres. Political pressure for a male leader led to Shajar's marriage to the Mamluk commander, Aybak. Aybak was later killed in his bath and in the following power struggle vice-regent Qutuz took over. He formally founded the first Mamluk sultanate and the Bahri dynasty. The first Mamluk dynasty was named Bahri after the name of one of the regiments, the Bahriya or River Island regiment. The name Bahri (بحري, “of the sea”) referred to their center in al-Manial Island in the Nile. The regiment consisted of Kipchak Turks. When the Mongol troops of Hulegu Khan sacked Baghdad and took over Damascus in 1258, one of those who escaped from Damascus was the Mamluk general, Baibars. He fled to Cairo. When Hulegu demanded that Qutuz surrender Cairo, Qutuz had Hulegu's envoys killed and, with Baibars' help, mobilized his troops. Although Hulegu had to leave for the east when Khan Mongke died, he left his lieutenant Kit Buqa in charge. Qutuz tricked the Mongol army into an ambush near the Orontes River, routed them at the Battle of Ain Jalut and captured and executed Kit Buqa. Qutuz's triumph did not last long: When he and the Mamluks returned to Cairo, Baibars assassinated Qutuz and seized power. In the following centuries, power would transfer the same way numerous times; the average reign of a Mamluk ruler was seven years. The Mamluks defeated the Mongols a second time in Homs, Syria, in 1260 and began to drive them back towards the east. In the process they consolidated their power over Syria, fortified the area, and formed mail routes and diplomatic connections between the local princes. Baibars' troops also defeated the last of the crusader states in the Holy Land. The Abbasids, who also took refuge in Egypt after the fall of Baghdad, were maintained as nominal caliphs by the Mamluks throughout their rule in Egypt, thus when the Ottomans defeated them in 1517, they could claim that the last Abbasid caliph ceded them the office and its insignia. In 1382 the Bukri or Burji dynasty took over. Burji (برجي, meaning “of the tower”) referred to their center in the citadel of Cairo, and it consisted of Circassians and Georgians). The Mamluk sultanate would survive until 1517, when it was conquered by the Ottoman Empire. The institution of the Mamluks would continue under the Ottomans, though it would not be the same as that of the Sultanate. In 1768, Sultan Ali Bey Al-Kabir declared independence from the Ottomans but the Mamluks crushed his movement and retained their position after his defeat. By this time new slave recruits were introduced from Georgia in the Caucasus. Napolean defeated Mamluk troops when he attacked Egypt in 1798 and drove them to Upper Egypt. By this time Mamluks had added muskets to their retinue of traditional cavalry charge tactics. After the departure of French troops in 1801, the Mamluks continued their struggle for independence, this time against the Ottoman Empire and Great Britain. In 1803, Mamluk leaders Ibrahim Beg and Usman Beg wrote a letter to the Russian general-consul and asked him to act as a mediator with the sultan, as they wanted a ceasefire and to return to their homeland, Georgia. The Russian ambassador in Istanbul categorically refused to mediate because the Russian state was fearful of allowing Mamluks to return to Georgia, where a strong national-liberation movement was on rise which a Mamluk return may have encouraged. 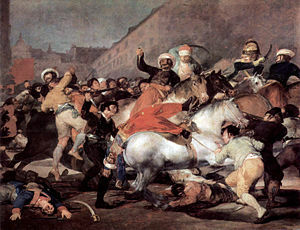 In 1805, the population of Cairo rebelled. This presented an opportunity for the Mamluks to seize state authority, but their internal tensions and acts of betrayal did not allow them to exploit it. In 1806, the Mamluks defeated the Turkish forces several times, and in June the rival parties concluded a peace treaty. According to it, Muhammad Ali, who was appointed as governor of Egypt on March 26, 1806, was to be removed and the state authority in Egypt returned to the Mamluks. Yet again, internal tension and conflicts between the clans did not allow the Mamluks to use this opportunity and Muhammad Ali retained his authority. Muhammad Ali knew that eventually he would have to deal with the Mamluks if he ever wanted to control Egypt. They were still the feudal owners of Egypt and their land was still the source of both wealth and power. In 1809–1810 Muhammad Ali managed to divide the Mamluks, between Egypt and Sudan. On March 1, 1811, Muhammad Ali invited all the leading Mamluks to his palace. At this event, there were nearly six hundred Mamluks (according to another source about seven hundred) on parade in Cairo. Near the Al-Azab gates, down from Mukatamb Hill, Muhammad Ali's forces ambushed and slaughtered almost everyone. 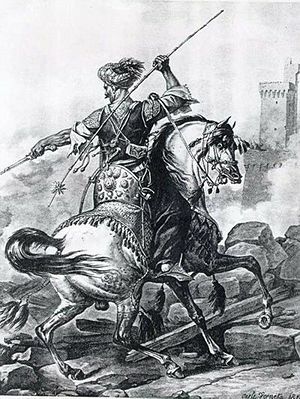 According to the tradition, only one Mamluk named Hasan survived when he made his way though the force of Muhammad Ali's attacking Turks and jumped with a horse over a precipice to freedom. Over the following week hundreds of Mamluks were killed throughout Egypt. In the citadel of Cairo more than one thousand (and in the streets about three thousand) Mamluks and their relatives were killed. One small group escaped to Sudan and settled in a village named Dongola. Many of them died within two or three years (among them Ibrahim Beg, who died in 1816). In 1820, Muhammad Ali pardoned them and allowed them to return to Egypt, but only 80 decided to do so. In the Ottoman Empire, Mamluks of Baghdad proclaimed their independence in the eighteenth century and remained autonomous until the Ottoman reconquest in 1832. Napoleon formed his own Mamluk corps in the early years of the nineteenth century and they became the last known Mamluk force. Even his Imperial Guard had Mamluk soldiers during the Belgian campaign, including one of his personal servants. Napoleon's famous bodyguard, Roustan, was also a Mamluk from Egypt. Throughout the Napoleonic era, there was a special Mamluk corps in the French army. In his history of the 13th Chasseurs, Colonel Descaves recounts how Napoleon used the Mamluks in Egypt. In his so-called "Instructions," that Bonaparte gave to Kleber after departure, Napoleon wrote that he had already bought about two thousand Mamluks from Syrian merchants from whom he intended to form a special detachment. On September 14, 1799, General Kleber established a mounted company of Mamluk auxiliaries and Syrian janissaries from Turks captured at the siege of Acre. On July 7, 1800, General Menou reorganized the company, forming three companies of one hundred men each and renaming it the "Mamluks de la Republique." In 1801, General Rapp was sent to Marseille to organize a squadron of 250 Mamluks under his command. On January 7, 1802, the previous order was cancelled and the squadron reduced to 150 men. By a decree issued on December 25, 1803, the Mamluks were organized into a company attached to the Chasseurs-a-Cheval of the Imperial Guard. Mamluks fought well at Battle of Austerlitz on December 2, 1805, and the regiment was granted a standard and a roster increase to accommodate both their standard bearer and a trumpeteer. A decree of April 15, 1806 defined the strength of squadron as 13 officers and 147 privates. In 1813 its Chasseurs-a-Cheval of the Imperial Guard a decree of March 17 established another company attached to the Young Guard. Despite the Imperial decree of March 21, 1815 that stated that no foreigner could be admitted into the guard, Napoleon’s decree of April 24 of that year prescribed, among other things, that the Chasseurs-a-Cheval of the Imperial Guard included a squadron of two companies of Mamluks for the Belgian Campaign. With the First Restoration, the company of the Mamluks of the Old Guard was incorporated in the Corps Royal des Chasseurs de France. The Mamluks of the Young Guard were incorporated in the 7th Chasseurs a Cheval. All links retrieved August 9, 2018. Note: Some restrictions may apply to use of individual images which are separately licensed. This page was last modified on 9 August 2018, at 15:52.